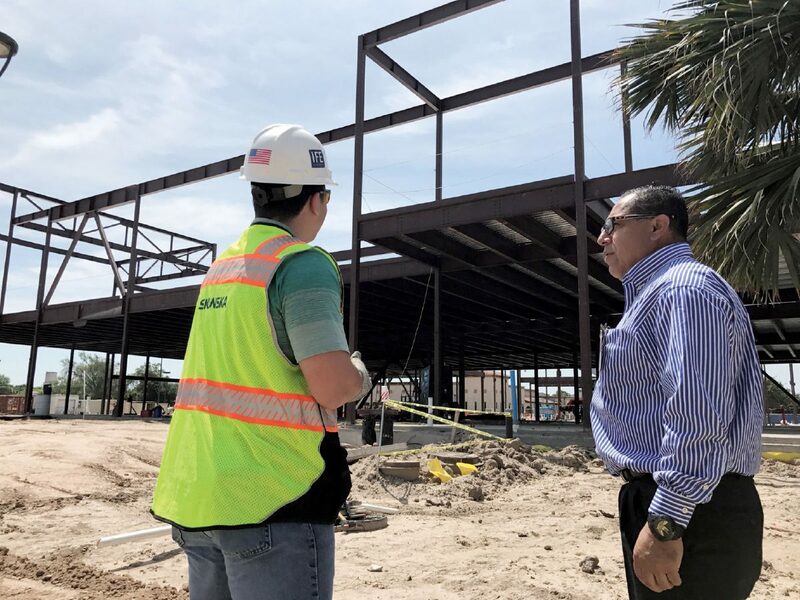 EJ Melendez, left, a project engineer for the South Texas College expansion at the Mid-Valley campus, updates campus administrator Daniel Montez back in April about the status of construction for the new health professions and sciences building. McALLEN — South Texas College campuses have been undergoing construction for about a year now, and while some are slated to be completed before 2018, others will require some reworking. The STC board of trustees received an update on all 2013 bond-related projects during a regular meeting last week in which several issues, such as sudden rust-like spots appearing on a newly built wall in the Mid-Valley campus, were addressed. Voters approved a $159 million bond four years ago for the construction of 26 projects at the Pecan Campus, Starr County Campus, Mid-Valley Campus, Nursing and Allied Health Campus, Technology Campus, a new Regional Center for Public Safety Excellence in Pharr, and a new teaching center in La Joya. At least 13 of these projects are on tap for completion by the end of this year — just in time to be furnished before the beginning of the spring semester — while the Technology Campus and new La Joya Center are now finished and operational. But a few are lagging behind or will need to be reworked throughout the semester. At the Pecan Campus there are six projects including two new academic buildings, a science building, student activities building, parking and a thermal plant completed in 2016. All of the remaining projects are slated to be fully functioning and open to students and staff by January. The Mid-Valley Campus also has six projects including a health and science building, library renovations and expansions, a student service building, parking lot, and a completed thermal plant. Just like the McAllen campus, these are all running up-to-date with only the parking lot expecting full completion and opening at the end of January. Even though the thermal plant in Mid-Valley was completed since July of this year, issues with the cinderblock used for its construction was found to be defective as rust-like spots begun to appear since completion. It started with 20 spots, construction officials said, a number that grew to more than 300 throughout the months in which they were investigating the issue. The provider of the blocks confirmed it was due to the use of contaminated sand and is willing to work with the contractors to replace them. Because the issue only seems to affect outside areas that are replaceable, the trustees agreed to complete removal and rebuild of these areas to ensure these issues don’t continue to arise. Contractors also assured the board that they will request warranties from the seller on the replacement product to ensure its quality once again. Several projects at the Starr County Campus have had to be reviewed for completion changes. This campus has six projects, all ongoing. Two of the projects are scheduled to be completed by the end of 2017 and fully operational, these include parking and site improvements and a thermal plant, which will be done in October and November. A health and science building, library, expansions to the student activities and student services building, are all slated for full completion in January. It is at this campus, however, that issues with a ditch that’s 10 feet deep, or detention pond, were brought up. In order to comply with city regulations, contractors placed a 7-foot-high fence, but the problem is that the fence is located right in front of the main entrance to the campus, making for a less-than-appealing view of the campus. During the meeting, trustees highlighted the need to comply with regulations while giving the campus an inviting appearance considering the chain-link fence covered the view of the newly built library. Contractors stated this fence was selected due to its low cost, but trustees asked to be presented with other fencing options as well as landscaping. The expansion of the Nursing and Allied Health Campus and its thermal plant are scheduled for fully operational by the middle of January, with the parking and site improvements being the first to finish at the end of this year. The only project that will take longer to open its doors to students and STC staff will be the Regional Center for Public Safety in Pharr, which is slated for completion in August 2018 and will open the doors to its first cohort starting the fall semester.